June 20th, 21st, & 22nd, 2003 Frogtown, Angels Camp, California, U.S.A.
YAMI BOLO was born Rolando Ephraim McLean on October 1, 1970 and grew up in Kingston 13. He acquired his stage name from a female acquaintance who noticed that he loved to eat; she mentioned that he was always "nyaming" on food and began calling him "Yami" in reference to that trait. The name stuck and he became Yami Bolo from that point on. Yami began his career like many youth in Jamaica by singing in church groups. He was noticed by Sugar Minott in the mid 80s and began working with his set, Youth Promotion, performing with them and voicing specials for the sound. During this time he hooked up with Junior "Jux" Delgado, who guided the young Bolo and gave him the benefit of his extensive experience in the music business. 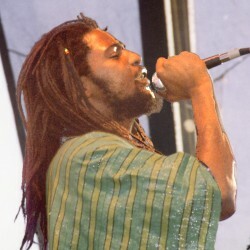 Yamis first single, "When A Mans In Love", broke in 1985 on Winston Rileys Techniques label and rode the popular "Ring the Alarm" riddim made famous by Tenor Saw. His next single, again under Rileys tutelage, was released the following year. That song, "Jah Made Them All", began to make people take notice of the still-teenaged Bolo. During this time, Yami appeared in sound system shows with Stereo Mars sound and was captured on a live video session at a PNP rally singing over that sound. In 1988, Yami renewed his association with Jux Delgado, and became part of Augustus Pablos Rockers outfit. With the Rockers crew he recorded great tracks like "Poor Man Cry" and a remake of Burning Spears "Door Peep" with the youths known as Ruffy and Tuffy. In the years since, Yami has recorded with many producers including Niney the Observer, Trevor "Leggo Beast" Douglas, Tappa Zukie, Lloyd Hemmings and Sky High (of Sky High and the Mau Mau). Yami is one of the youngest practictioners of the "Waterhouse" vocal style, made famous by Michael Rose and Junior Reid (and to a lesser extent by Don Carlos) and best illustrated by the sound of Black Uhuru in its many incarnations. Yamis sound is perhaps closer to the Half Pint school of Waterhouse vocalization, but the roots of his vocal stylings still show the influence of the "stani nichi oy" warblings made famous by those Waterhouse singers mentioned above. Perhaps Yamis most famous (and exciting) record has to be his duet with Capleton, "Put Down Your Weapon" released in the late 90s on the Fateyes label. Not only did this single team Bolo with the hottest fya burn chanter of the time, but showcased his vocal style and delivery like no other song had. Yami also contributed songs to the soundtrack of "Life and Debt", a film about the continuing dire economic crisis that Jamaica faces. He made a cameo appearance in the film walking the streets of Kingston singing "Be Still Babylon", a track from the Tappa Zukie produced album "Cool and Easy". The soundtrack album from the film, recently released on Tuff Gong includes another Yami Bolo song "Worldwide Corruption", instead of the song featured in the actual film. Also recently released is a great album on the Roots Foundation label titled "Healing of All Nations", which features Yami Bolo singing in a fine style over revived riddims from the past. This is a must-hear album and one of Yamis finest efforts to date, produced by Linval Thompson, and featuring hard hard riddims laid by original Roots Radic band. Copyright © 1998-2003 Sierra Nevada World Music Festival, LLC / Epiphany Artists. All Rights reserved.